Powerful formula enriched with Bulgarian Rose Water and Bulgarian Rose Oil dedicated to skin health and beauty. Bulgarian Rose Water maintains the normal PH of the skin, acts as a skin hydrator while soothing itchiness or irritation. Rich in vitamins, minerals and antioxidants, Bulgarian Rose Oil has excellent nourishing and emollient properties. It slows down the natural aging processes and protects the skin againts harmful environmental factors. 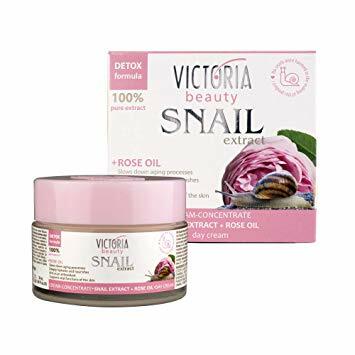 Snail Extract is rich in allantoin, collagen, elastin, ow-molecular-weight hyaluronic acid, and phyto antibiotics. It speed ups skin metabolism, facilitates cellular structures regeneration and helps restore skin elasticity and firmness. Overall, the product delivers optimal hydration and nourishes the skin, slows down the aging processes and strengthens skin structures. How to use: Apply in the morning on cleansed skin. Avoid eye area.